Jo Johnson quit as transport minister yesterday in a bombshell resignation which included a scathing assessment of the Prime Minister's Chequers proposals. 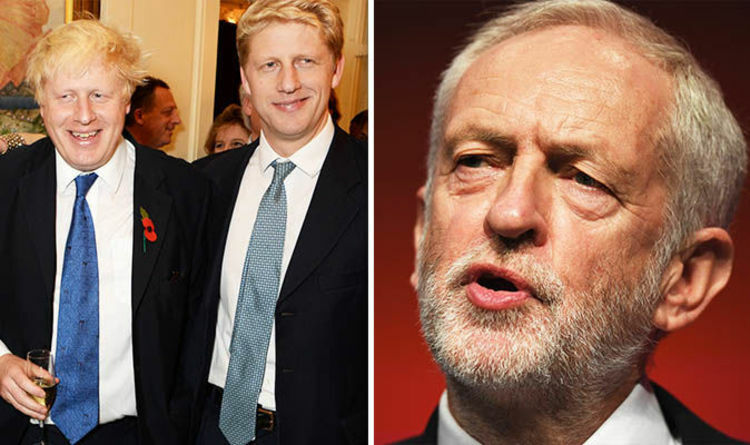 But despite Boris Johnson tweeting he was “united in dismay” with his younger brother over Mrs May’s plans, the Labour leader today claimed the family is at loggerheads over the issue. Dismissing the Chequers blueprint put forward by Mrs May in the summer, Mr Corbyn said “most of the Cabinet” do not agree with it. He added: "Seven ministers have already resigned over Chequers, and we've got two Johnsons at war with each other over Chequers. "Maybe three Johnsons. Dad's joined in as well, I understand." Jo and Boris Johnson backed opposite sides in the run-up to the 2016 referendum, with Boris a key figure in the Leave campaign and Jo supporting Remain. In his resignation letter, Jo Johnson branded Mrs May’s negotiating strategy “delusional” and warned the only outcomes her soft Brexit plan would result in were either EU vassalage or the “chaos” of a no deal. Speaking today, the former minister attacked the "fantasy set of promises" made during the referendum by Brexit campaigners such as his brother. And he said the huge difference between what was promised and what is on offer meant it would be a "democratic travesty" if the public was not allowed another say. Hinting there could be more resignations in an interview on BBC Radio Four today, he said: "This is one of the most momentous questions we will ever face in our political careers. Boris Johnson expressed his “boundless admiration” for his younger brother in a tweet following his resignation yesterday. He wrote: “We may not have agreed about Brexit but we are united in dismay at the intellectually and politically indefensible of the UK position. Responding to his son’s departure yesterday, Mr Johnson's father, Stanley Johnson, told Channel 4 News: "I'm reminded of Tennyson's Charge Of The Light Brigade. "I mean volley to the left of the them, volley to right of them, and the Prime Minister charges on into the valley of death. "And thank God Jo has come out today with a bit of sanity. Saying we have got to draw back from this cliff edge." Brexit talks are scheduled to resume tomorrow with negotiators frantically trying to reach consensus on the Irish border question. Disagreement over a ‘backstop’ to avoid a hard border in Ireland is the last remaining hurdle in the way of a deal but both sides have refused to budget on their demands. It emerged this week that Brussels could be prepared to concede to Mrs May’s insistence on a solution which would keep the whole of the UK inside the EU’s customs union if no deal is reached. This would avoid the need for customs checks along the politically sensitive frontier between Northern Ireland and the Irish Republic but reports suggest the EU may only agree in exchange for continued fishing rights in Britain’s waters. Mrs May’s Cabinet is scheduled to meet early next week as the Prime Minister attempts to sell her proposals to ministers. If they agree to back it, an emergency summit of EU leaders could convene to sign the deal off later this month.